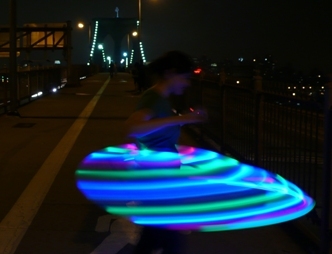 « Super Bright 20 inch LED Mini Hoops! 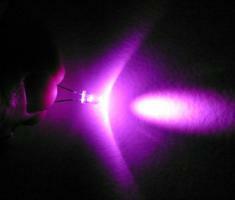 Now you can power your LED hoop with only one AA battery, rechargeable or alkaline. No need to hunt for an outlet or wait for a charge, just pop out the old battery and insert a fresh one. This upgrade is a bit more affordable than the full rechargeable upgrade and acts as a much more flexible power system. You can hoop “off the grid”, in the desert (burningman) and not worry about recharging if you take a few AA with you. Keep it green and try to use NiMh rechargeable batteries instead of alkaline but it accepts both. Charge them at home and carry a few with you when you travel. You’ll probably only need to put 2 or 3 in your pocket. A typical 2450mAh rechargeable AA battery will last about 3-4 hours powering 21 LEDs. The brightness level is the same as that old non-rechargeable lithium battery, so there is no change in quality. Your AA battery sits in the same place as usual near the tube connector so if you already made your hoop the surgery is minimal. Swapping batteries is quick and easy. Pull open the connector, remove the battery from is convenient holder, and slap another fresh AA back in and close up the tubing. This gets you up and running in less than 3 minutes! Nothing can recharge faster than that. Other professional hoops can take 12 hours to charge, even the fastest rechargeable LED hoop from ProdMod will take about 1 hour. Even in the worst case scenario you can charge one AA NiMh battery in about 15 minutes using the latest charging technology commonly found in stores today. So if you simply can’t wait for a charge or cant find an outlet, or don’t want to carry around a charger, you can use this new AA battery module upgrade along with a few AA batteries in your pocket to get back on the hoop in a flash! Nothing else lights your hoop quicker than the Prodmod AA Module Upgrade. 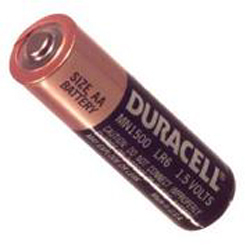 Carry 3 or 4 AA batteries with you and you are good for 12-15 hours! Who needs to sleep when your a hooping anyway? If you are interested in upgrading your hoop with this flexible power system you can buy the upgrade kit on this site. It includes the AA battery circuit and a battery holder. The AA circuit module connects between your switch and LEDs. Soldering required. Pre-wired sets are also available to avoid soldering. How about battery usage for mp3 player and mp4 player?